Now with the Revolution Slider 5.0! Flare is superb, it is a quality theme and is so impressive. I have no hesitation in recommending it to everyone. Support from Michael is exceptional – if only every Envato author was as helpful and attentive to their customers! 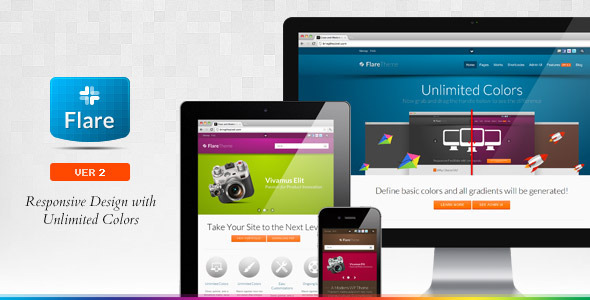 Flare is easily a five star product – I cannot recommend it highly enough. Buy it now – you will not regret it! It’s been great working with this theme. Michael goes above and beyond to help his customers. It’s important to recognize the good authors that produce quality work and provide awesome support! Just wanted to send you a HUGE Thank you! This is the most rockin’ theme we have ever worked with. This is the best theme I’ve ever used! Awesome functions, shortcodes, easy to use and fantastic support! I felt in love with this theme, awesome work dude ! # Improved - Back To Top link - smooth scroll instead of a "big jump"
# NEW - page template "Left Nav + Left Sidebar"
# NEW - page template "Right Nav + Right Sidebar"
# NEW - Pinterest icon added to the Feeds. # Improved - Featured media. Attachment caption can be used in a lightbox. # Improved - Featured media. Attachment description can be used in a lightbox. # Improved - Precontent logic. It's faster and without an extra load. # Improved - [fluid_wrapper] shortcode. The "width" and "height" attributes are available. # Improved - [feeds] shortcode. Now it handles empty feeds correctly. # Fixed - [divider] shortcode. Fancy kite looks OK.
# Fixed - FlexSlider. 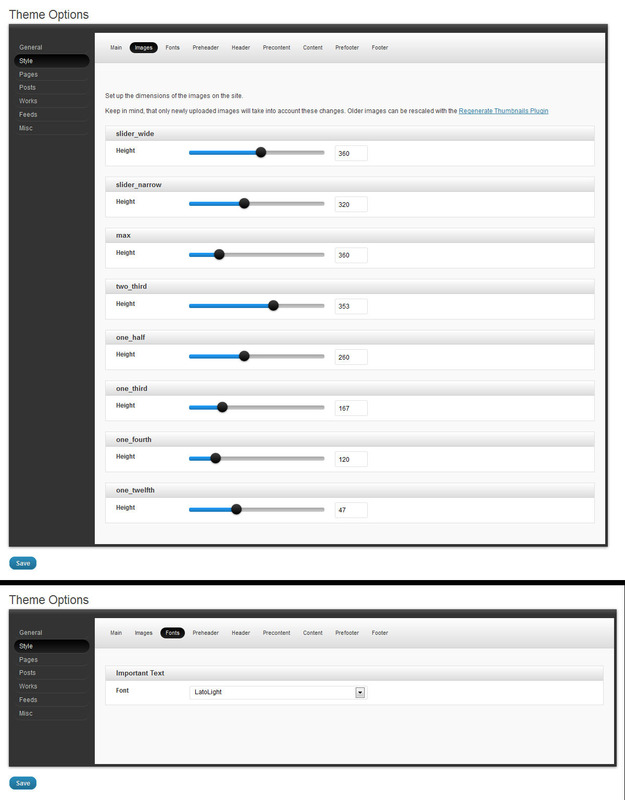 The Slider Manager works OK with WPMU. # Fixed - custom 404 pages works OK.
# Fixed - YouTube player shows controls OK.
# Fixed - [before_after] shortcode. The "width" and "height" attributes work OK.
# Fixed - [message] shortcode. CSS rule typo. # Fixed - Text logo looks exactly the same on every page. # Fixed - Search widget is visible even when the searchbox in the header theme area is hidden. # NEW - filterable templates for the works section. 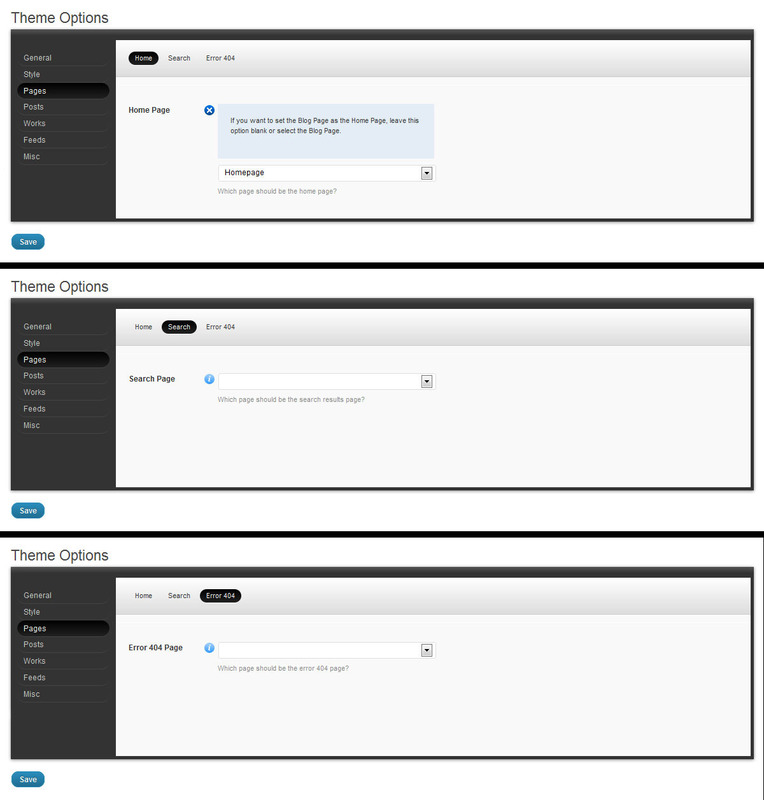 # NEW - change font-sizes from the Theme Options panel. 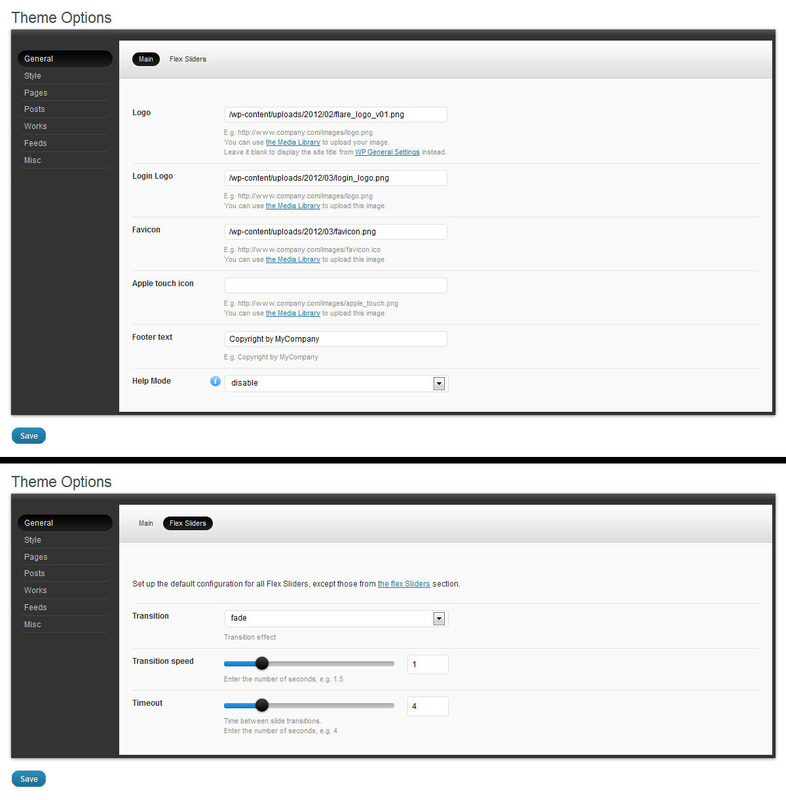 # NEW - enable|disable feeds in the header theme area from the Theme Options panel. # NEW - subheading shortcode instead of skipping heading level, like h1 before h3 (better for SEO). # Improved - now logo is inside h1 tag only on the homepage ( better for SEO). # Improved - main.css. More comments, better organization. 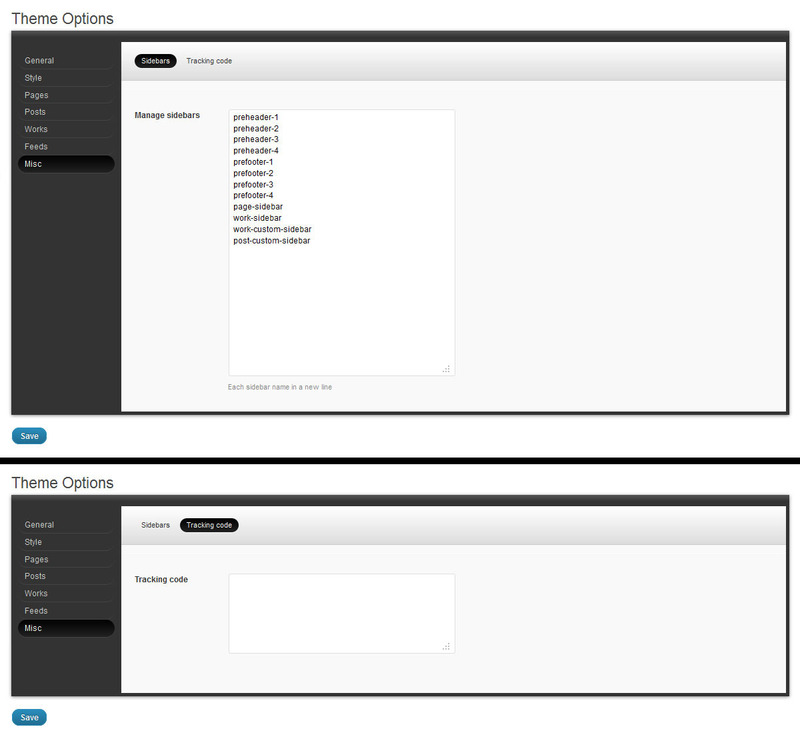 # Improved - custom menus. Now you can disable a link by setting the "no-link" as menu item class. # Fixed - menu locations. PrimaryNavigationMenu, SecondaryNavigationMenu and FooterNavigationMenu don't overwrite other menus anymore. # Fixed - about author section. Display control works OK.
# Fixed - post archives. Display control works OK.
# Fixed - frame shortcode. The "lightbox_group" attribute is now present in the Shortcode Generator. # Fixed - frame shortcode. 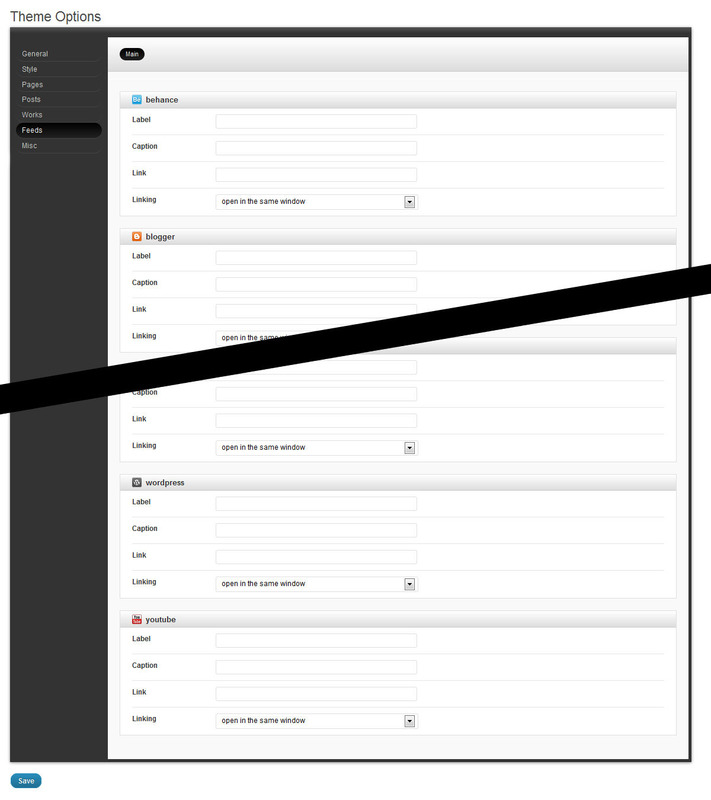 The "board" type in the Shortcode Generator works OK.
# Fixed - GravityForms conflict. The "FlexSliders" menu item is always visible. # Fixed - single.php. Fixed & improved. # Fixed - archive.php. Fixed & improved. # Fixed - index.php. Fixed & improved.